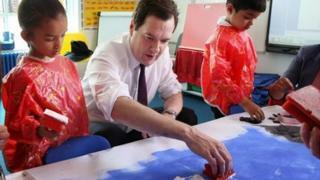 The schools budget for England will remain protected from budget cuts in the government's spending review. Chancellor George Osborne also announced plans for a fairer funding formula for schools to remove inequalities between different areas. There will be funding for 180 more free schools and 20 university technical colleges and 20 studio schools. Mr Osborne told MPs that spending on education was the "single best investment". The education budget for 2015-16 will "increase to £53bn and school spending will be protected in real terms", the chancellor announced. Mr Osborne promised that a consultation would begin for a national funding formula to address the way that money is not "equally distributed" between schools, the chancellor told the House of Commons. He announced extra support for the creation of 180 more free schools in 2015-16, which are set up by parents or other groups. There are already more than 80 open with a further 200 in the pipeline. There will also be 20 more studio schools which young people can attend part-time while working. There will be 20 more university technical colleges which are intended to provide a stronger vocational education. The protection of the school budget was welcomed by head teachers' leader Russell Hobby. He also supported plans for a fairer national funding formula, saying that "budgets can differ by thousands of pounds per pupil for no good reason". But Mr Hobby, leader of the National Association of Head Teachers, was critical of extra spending on free schools, describing it as an "inefficient use of a limited capital budget" when there was such a pressure to create more primary school places. Mr Osborne's package of spending cuts include an end to annual progression payments in the public sector, a move that had already been announced for teachers. There were warnings that cuts to local government would have a knock-on effect for schools. David Simmonds, chairman of the Local Government Association's Children and Young People Board, warned that a £200m cut to council funding for school improvement would make it harder for schools to raise standards. "Government's promise to protect school budgets has been undermined by this disproportionate 20% cut to the vital support they receive from councils," said Mr Simmonds. The Department for Business, Innovation and Skills, responsible for universities, will face a 6% cut. This will include not raising student maintenance grants in line with inflation, saving £60m. The National Scholarship Programme, providing support for poorer undergraduates, will be cut from £150m to £50m, and switched to supporting postgraduate students. Mr Osborne promised a greater commitment to science and research, saying that previous governments had put "short-term pressures over long-term needs". He commended developments such as synthetic biology and graphene. But the ring-fenced protection of school spending was challenged by Sir David Bell, vice chancellor of Reading University and former permanent secretary at the Department for Education. School funding "ought to have been exposed to the same scrutiny as other aspects of government spending", said Sir David.